Happy Birthday RJ is a 1980s birthday themed murder mystery party for 12-16 guests (plus one host) published by Freeform Games. Set in the world of the oil soap operas (along the lines of the Dallas and Dynasty television shows), Happy Birthday RJ concerns RJ Harrington's 30th birthday and coming-of-age party. It's a world of glamour - of big money, big hair and big shoulder pads. And with the dysfunctional Harrington family and their scheming friends and neighbors, it's a birthday party that anyone is unlikely to forget. Luckily for everyone, the local deputy sheriff is also attending the party (he's a close friend of Bobby Harrington, RJ's brother). That's just as well, as Happy Birthday RJ includes a horse theft, a murder before the game and a murder during the game! And that doesn't include anything that the players might want to get up to! 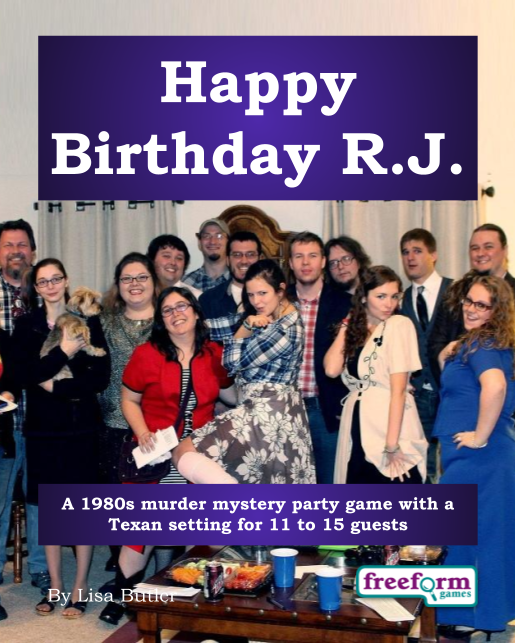 Happy Birthday RJ is an interactive murder mystery game, which means that all the players have full character details including a comprehensive backstory, goals that they should try to achieve, and information about other characters. Happy Birthday RJ also provides players with items (representing money, shares in the family business and other clues) and abilities (that let them detect secrets and find out information about other people). Interactive games are my favourite types of murder mystery game - I think they're much more entertaining than the other styles. Plus the person organising the evening. Like other interactive murder mystery games, the final outcome of Happy Birthday RJ is up to the players themselves. They each have their own character with their own desires and objectives - and it's up to them to interact with the other guests and try to achieve their goals (not everyone will succeed, of course!). Instead of a formal dinner party, Happy Birthday RJ is better suited to a buffet meal or finger food. Happy Birthday RJ needs a dedicated host, someone to organize the game. Happy Birthday RJ is available from Freeform Games and costs $29.99 USD. Click here to buy Happy Birthday RJ from Freeform Games. For more information about Happy Birthday RJ, click here to download the free introductory pdf file which includes more details - including background, a full cast list, costume guide and invitations.